We’re not expecting many gifts brought to our wedding, but I figure cards might be a bit more common so wanted to include something to hold them in and just set it on the same table as our guest “book” set-up and call it a day.Â From what I can tell, it’s fairly common to include a picture of the couple (another use for that engagement session) on the table with the guest book–and that’s when I worried said table might become a bit cluttered. Since our guest book is actually a cork cage, I thought a card cage would be a bit much even if they are one of the prettiest options out there. The mailbox idea is cute, but it’s tough not to look at them and see the montage from UP! and that leads to instant waterworks. A suitcase wasn’t right and while the cardbox monsters are absolutely adorable, it was a little more levity than I had in mind. But something needed to be decided, so I picked up one of those generic patterned paper boxes at the craft store with the intent to paint or otherwise cover it. I’d used one of these at a shower I threw a few years back and just inserted a skewer to keep the lid propped up. It was functional if nothing else. 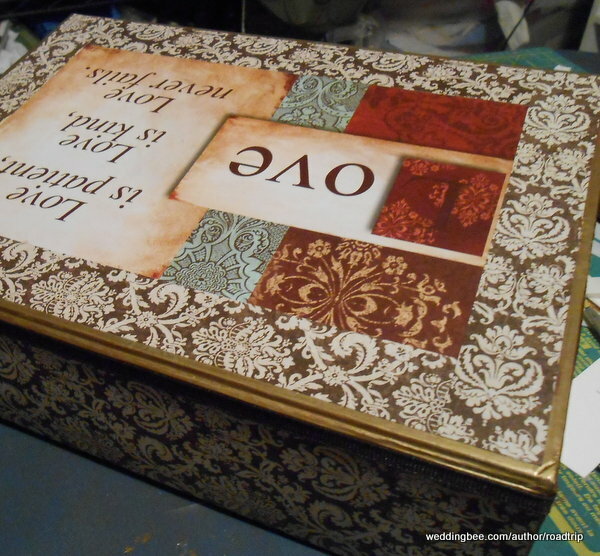 However, this was right around the time I was making the mini-books for our centerpieces so I started looking at the box from a different angle and decided if I could fashion a way to keep it open without losing the cards inside when the box was moved, why not do that instead? And if it’s standing up like a book (or a picture frame, ahem), why not put our engagement picture there instead of on it’s own? 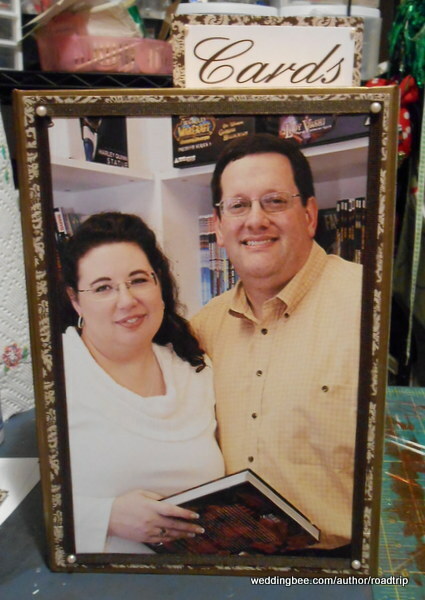 I even had some of the envelope liner/mini-book cover paper leftover, enough to cover most of the “cover” of the card-box book and create a mat for our photo on the front. 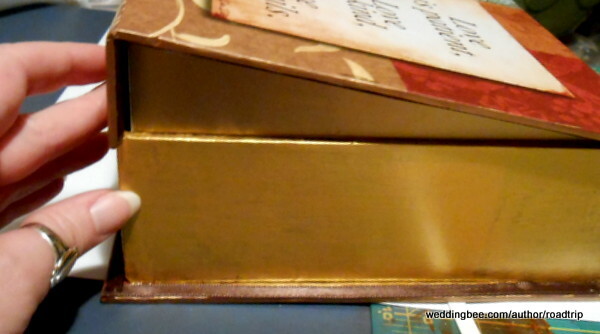 First things first, I had the gold paint out again and decided to go ahead and paint the narrow sides of the box/book. It probably would have been best to prime it with a layer of gesso, first, so that it wouldn’t take four coats of the metallic gold paint, but it eventually got where the pattern wasn’t showing through so no harm, no foul. Not that I’d consider trying to color the entire side of the box, but, hey, for edges it works! For the edges where paper coverage was less likely, instead of getting the paint back out I opted to use my metallic sharpies and they worked amazingly well covering up the patter on the edges and dried much quicker, too! 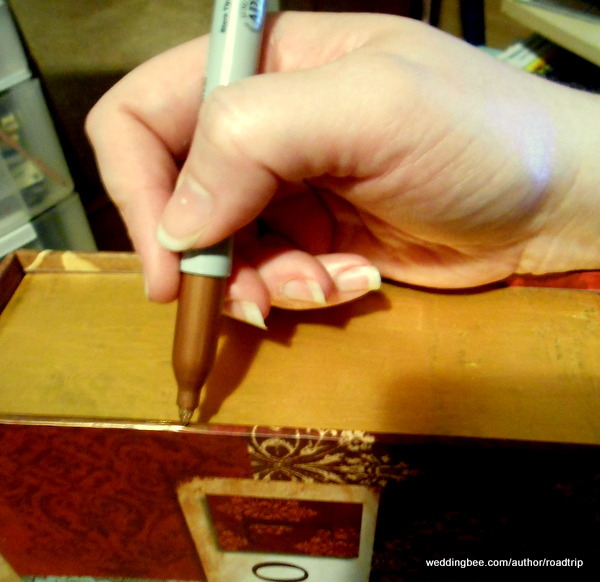 I liked the ease of the marker so much that when it came time to create the shim to hold the box open/create a base for the box, I colored over the paper with the bronze marker, too, and it worked wonderfully. And it was around this time I realized I’d fit the shim to the wrong end of the box–oops! Good thing nothing was glued down, yet. By adding a couple of metal washers to the shim, the flap of the box will serve the same purpose: keeping the lid (that’s now the front of the book) in place! In this case enough that I don’t have to permanently adhere the shim to the inside of the box so we can use it to store the cards or other memorabilia after the wedding. Rather than cut tiny little strips to line the inside edges of the box/book, I used ribbon to cover those areas, mostly it just needs to blend in more than anything, so the darker color of the ribbon works better for that than the patterned paper would have anyway! Then it was just a matter of cutting the paper to size and adhering it to the box, then using 1″ strips to create a mat around the edge of the cover before attaching our photo. Preferring the look of finished edges, though, I decided to take a bit more ribbon and frame the photo and then dressed it up with some self-adhesive pearls. The final touch was to mat a little “cards” sign on a scrap of the patterned paper then create little legs for it to stand on at the top of the book. I colored the flat portion of the legs to match the gold paint it’d be sitting on, but left the other half white so it would blend in with the paper. Minor details, sure, but it’d be far more noticeable if I’d left them out.